Many people like watching TV series. No one likes to keep in mind what episode he/she watched last time and which one to open now. Episode Player solves the problem. It remembers the episode you\'ve watched and starts playing the following one. Many people like watching TV series. No one like to keep in mind what episode in he/she watched last time and which one to open now. Episode Player solves the problem. This free tool remembers the episode you have watched and starts playing the following one for you. It is so easy to use it! Just open the program and select the folder with your movies. 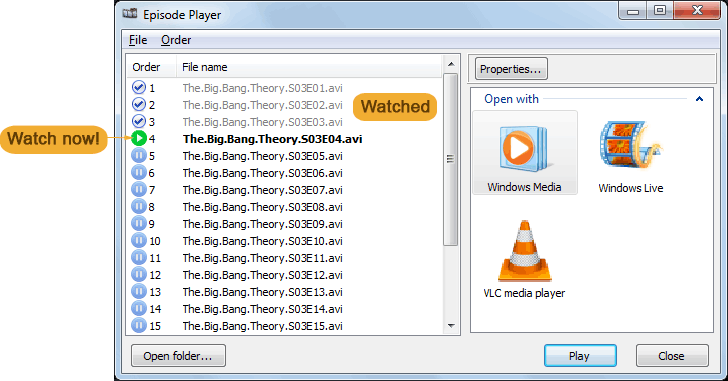 Episode Player works with any video player installed on your computer. Try the free copy now! You can convert DVD movies and ordinary videos to 3D movies and other popular videos with the help of 4Videosoft DVD Converter Suite. You are able to back up the iPod files to PC freely.